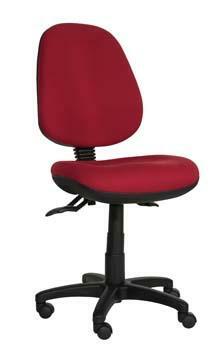 The best selling chair in the market place.For very good reason!!!! Very comfortable.Great support for sore backs. Suits most body shapes particularly women and small to average men.. Heavy Duty Mechanism with 10 yr wty. Can be covered in clients choice of fabrics,the back panel can be covered for a small charge. We can add arms,we can build with a chrome base. Dual Density Moulded Foam Seat, Moulded Lumbar Support, 3 Lever Mechanism, Gas Height Adjustment and Independent Seat Tilt and Back Tilt, Plastic Outer Back For Durability, AFRDI Level 6 Tested. Stocked in Ambience pirate fabric. [Black]Heavy duty commercial fabric range.Open weave which allows fabric to breath!